The Gallery Collection, as part of our charitable donations program, donated 6 assortment boxes of greeting cards to Cedar Hill Elementary School in Towaco, NJ for use in auction at their annual Tricky Tray fundraiser. 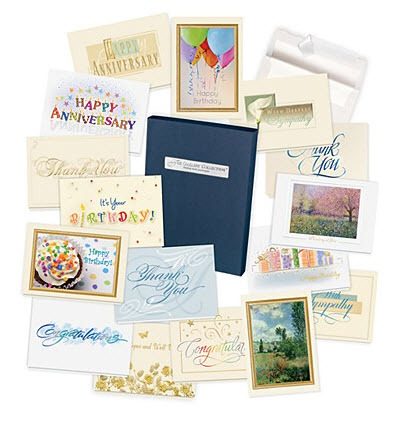 The assortment boxes included Birthday Cards and All Occasion Cards. The school’s mission statement indicates that every stakeholder in their learning community unites in an effort to engage children in the joy of learning. Cedar Hill is a “Positive Action School”, and to that end, they encourage students to accept responsibility and to contribute their gifts and talents to realize their potential as citizens of a global society. Throughout the year, students participate in a variety of activities that reinforce the theme of respect for themselves, each other, and the school community. If you are interested in learning more about Cedar Hill Elementary School, please visit their website at http://www.montville.net/Domain/36. It is great that your company takes the time to donate to charity. Glad I order my cards here! I think it’s commendable that Prudent makes donations to schools. With all the budget cuts being made, schools are forced to have more fund raisers now more than ever. Every little bit helps! Nice job Gallery Collection! I am sure the school is very appreciative of the generosity. I love tricky trays and silent auctions and what a wonderful way to contribute to the education of children. I just wish I had been there for this event as the assortment boxes are my absolute favorite item from The Gallery Collection. Next post: Should Your Office Have Casual Dress Attire?